A friend of mine, a person whom I’ve known since kindergarten, a very kind, caring, good hearted woman shared an article on Facebook two days ago. I found it odd because she normally does not share political stuff, but usually sticks to stories about animals, animal cruelty and vegetarian eating. Yes, besides being a kind, caring person, she happens to be a liberal. Anyone who knows me knows I am not a liberal, not in the remotest. But I am not heartless or cruel. I care about others, in fact my entire professional life has been dedicated to caring for victims of crime. Yes, I actually went into this job for the very cliche reason of wanting to help other people. 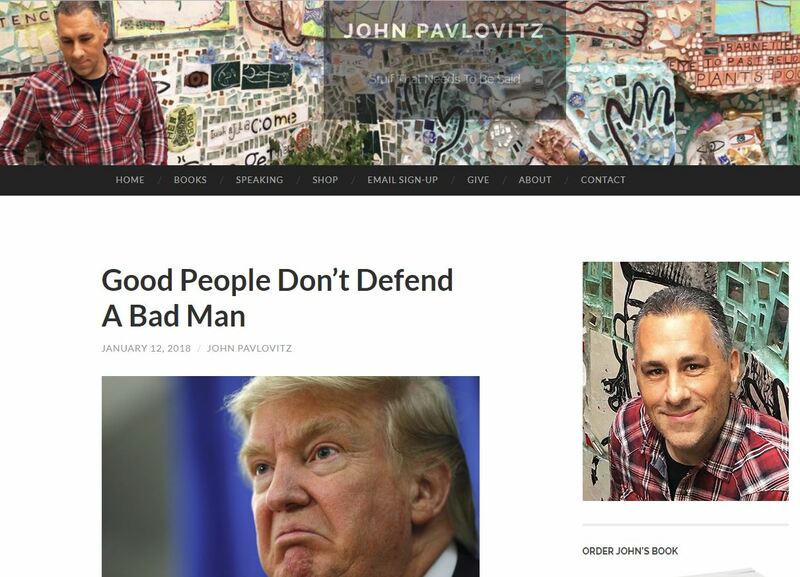 The article she shared was titled “Good People Don’t Defend a Bad Man” and it was accompanied by a picture of Donald Trump, with the obligatory angry appearance taken fully out of context. To say I was taken aback would be an understatement. Here is a woman I have known all my life who is essentially saying that I am a bad person because we disagree on politics. In a very unlike me move, I chose not to respond for fear I would overreact, and instead I let it percolate a few days so that I could temper my thoughts on the matter. Dehumanizing the enemy is a tactic as old as time, but it is most often used in times of war, and it is used by both sides, “good” and “bad.” During WWII, the Nazis dehumanized the Jews and Japan dehumanized Americans, just like America dehumanized the Germans and the Japanese. Why? Because it is easier for soldiers to do their job, on either side, when they hate enemy they are fighting. That is all fine and dandy, in a time of war, but sadly this is one American dehumanizing a very large group of other Americans simply because they support a different political ideal. “They don’t take away healthcare from the sick and the poor without an alternative. For instance, “Good people don’t refer to a group of 5 million Americans who have done nothing beyond joining a civil rights group as murderers.” Something the left often does when they call the NRA and its 5 million members murderers. “Good people don’t defend a socialist, racist, anti-law and order terrorist organization which has murdered many Americans for nothing more than their chosen profession.” Which is what the left is constantly doing when they support and push Black Lives Matter and their anti-American agenda. “Good people don’t Tweet anti-Constitutional rhetoric, in an attempt to violate the rights of millions of Americans, using the still warm bodies of murdered children to stir emotions.” Yet this is exactly what happened after Sandy Hook, and used the adult victims in many other mass casualty incidents, all in an effort to infringe on the 2nd Amendment rights of all Americans. “Good people don’t steal money from hard working, struggling Americans and freely give it, along with food and water purchased using that money, all in an attempt to earn political favor, while using the suffering American citizens as political props to bolster their hate filled rant against the president.” But that is exactly happened to the aid sent to Puerto Rico, but the left still blames Trump instead of the corrupt Puerto Rican politicians who stole it. “Good people don’t force young healthy people to purchase healthcare they do not need and cannot afford. Good people don’t push lies claiming that not forcing people to purchase healthcare they don’t need is the same thing and forcibly taking away their healthcare.” But that is exactly what Obamacare is, and that is exactly what the left is doing in referring to the removal of the fines for not purchasing Obamacare. “Good people don’t refer to a tax plan that helps far more middle and lower income families than it hurts as ‘gouging the working poor’ or a tax plan whose corporate tax breaks have already seen numerous large corporations moving production back to the US, or giving millions of dollars in bonuses to their non-executive employees.” But that is exactly what this author and much of the left is doing. We must, all of us, remember that having different opinions is important for the health of the country. Being able to discuss those differences in a calm, logical manner is even more important. Writing off those who disagree with you as “bad people” is very dangerous, self-destructive, and if it continues, it will lead this country down a very dark path. If this divisive, dehumanizing tripe is resonating with a woman I’ve known as a kind, caring person for 40 years, I am very scared about what it is doing for those who are not as kind and caring as she. I typed a response but before I could post it, their original comment disappeared. This is my reply: The thought did occur to me as I wrote this, which is one of the reasons I wrote it. I need to remind myself of my own shortcomings at times as well. Trump is Destroying America… or is He?